Where are all the handliners? I understand that fewer people fish now and even fewer pull wire but no one else on a perfect weather Friday night? That’s just ridiculous. That was the case though this past Friday. I was the only one fishing the Trenton channel. Just me, no one else, nadda, zip, no ah ah. I can’t understand it either. It was a near perfect night. A slight breeze, partly cloudy skies, no weeds and temps in the low 70’s. There weren’t any pleasure boaters out either. Just me and the fish. I started at 9:30 pm and was done less than an hour later. 5 more for the freezer, 1 throwback and only 2 blankity blanks. Like I said, a near perfect night. Maybe everyone is believing all the social media hype this past Spring of no fish. How the commercial fishermen caught them all. 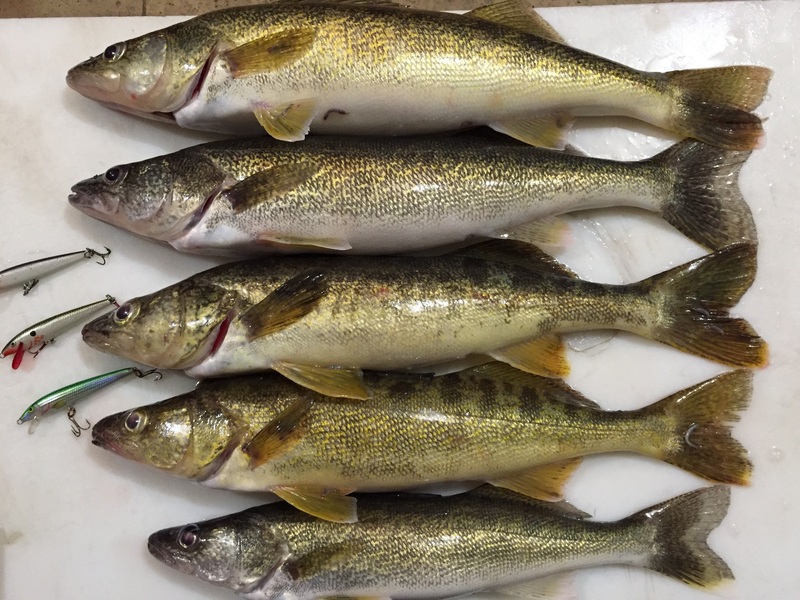 How the DNR are mismanaging the walleye population. How tribal fishermen are secretly catching all the fish to sell to Estonia, oh wait, that’s the Lake Trout. My mistake. One very small item of note is this little guy. I pulled him out of the top walleye as I was cleaning him. 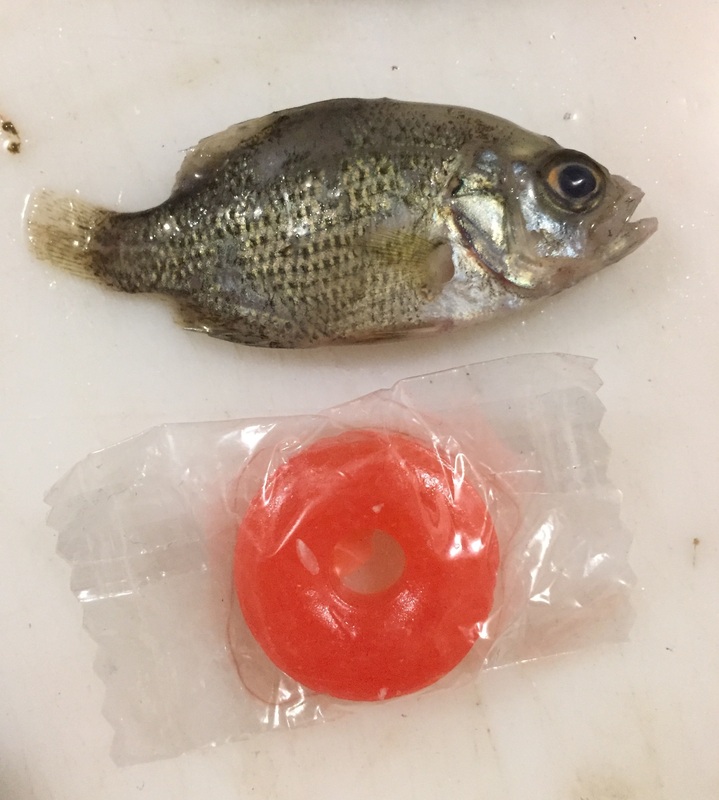 I posted the pic on Facebook and told everyone that it is the smallest fish I ever caught while pulling wire. No one has figured out how I managed to do that yet. Since Friday night went so well I decided try for a repeat. This time I invited my friend Larry along to get in on the easy fishing. Conditions were about the same except for the wind coming out of the SW but it was nothing to be concerned about. We did see two other handliners out though but one of them was an upstreamer so I really don’t count that boat. We started at 9:15 pm and it wasn’t long before I had one in the cooler. Larry didn’t even have his lines in the water so of course I started giving him grief about it. It continued as I landed numbers two and three, tossed back a couple of undersized ones and lost one at the boat. I suggested he start adding to the cooler otherwise it was going to be a long night for him. After that initial flurry things slowed down. We managed to pick up 5 more over the next 2 hours but it was one here and there. Just about the time I was thinking about moving to a different location one of us would catch or lose one and I would change my mind. On our last run we lost 3 in about 5 minutes. Larry was having a tough time with snap swivels. Three of them broke and he lost a couple of lures because of it. I know that feeling, I lost 3 lures and 3 fish one night because of that. All of my snaps were replaced the next day. Around midnight we packed it in. The weeds were getting worse and even though it was a no moon period the blankity blanks kept feeding after dark. No sheepshead though but I did catch my first channel cat for the year. We both thought it was big walleye until he was in the boat. It was still a pretty good night. We ended up with 8, threw back 4 and lost just about as many. The fish were anywhere from 15 to 20 inches. Most came on #9 Rapalas in original or bleeding olive. No pictures tonight, Larry took his home and I just cleaned mine without taking a pic first. Just refer to the Friday catch picture and block out one fish. Sunday was supposed to be a day of fly fishing but 20 mph SW winds took care of that. I walked around the lagoons at Sterling State Park to scout out the area for fishing opportunities. I was hoping I could wade around instead of taking my kayak. Still undecided about that. I might go back this upcoming weekend. The weather is looking pretty good for the rest of this week. I’ll go walleye fishing at least once, possibly more. Still trying to find an area with some active carp that I can cast a fly to. It would be great if I could find a Mulberry Tree along some water. Late last year my father was diagnosed with prostate cancer. At first the oncologists had it under control but around the beginning of February he developed a couple of blood clots and things started going south from there. The chemo and radiation treatments were taking a toll on him. His legs started to swell up, he was losing weight and the treatments were zapping his strength. May was a particularly bad month and I was beginning to wonder if my last fishing trip with him was going to be a waste of a salmon trip out of Harrisville last September. He was staying with me for the whole month so he could go to the Ann Arbor VA for his daily treatments and I felt guilty going fishing. It just didn’t seem right me being out there when he was back at my house and so miserable. I had people asking me to tag along on my boat and I really didn’t want to take anyone. That extra spot in my boat is reserved for my Dad and I didn’t want anyone else catching fish from it. Fortunately, thanks to the oncologists at the VA in Ann Arbor, a little luck and a lot of prayers he turned around and started getting better. The cancer is still there but it is in regression. This summer was spent getting his weight and strength back and now he and I can go walleye fishing once again. Of course now that he has the strength to go fishing I don’t have a boat. This is where my friend Richard saved the day. He offered to take my Dad and I out the next time he was down. Well luck was on our side and the rain passed so even though Richard’s face was half numb from an afternoon dentist appointment he picked us up and we were on our way. We started a little late, around 7:30 pm, and headed to the same spot I caught all my fish last Friday. Since Richard’s new boat is a side console he offered to just drive while my Dad and I sat in the back and fished. I got my Dad set up and went about getting my lures in the water. While I was doing that my Dad pulled in his first walleye for 2014. Mission accomplished. All I wanted for him was to get out and at least catch one fish. I was hoping that this early success would mean more fish but it turns out we would only get 1 more for the night. That’s ok though. This trip was about getting him out on the water more than anything else. It was a beautiful night out, very few clouds, no wind, no bugs, not many weeds just not many fish. At least we got to go and it looks like we will be going again. As I said before it was a perfect night out. Weeds were minimal and the water is still clear. Surface temps were back up to between 57 and 58 degrees. It needs to get down to the 50″s to get some of the bigger fish on the move. My Dad caught his fish on a #9 Bleeding Olive Rapala and I caught mine on a #11 Bleeding Chartreuse Rapala. Both of them were in the 18 inch range. I didn’t feel like cleaning 2 fish so when Richard dropped us off I told him to keep the fish. He was nice enough to drive us around for a few hours and I thought it was the least I can do. 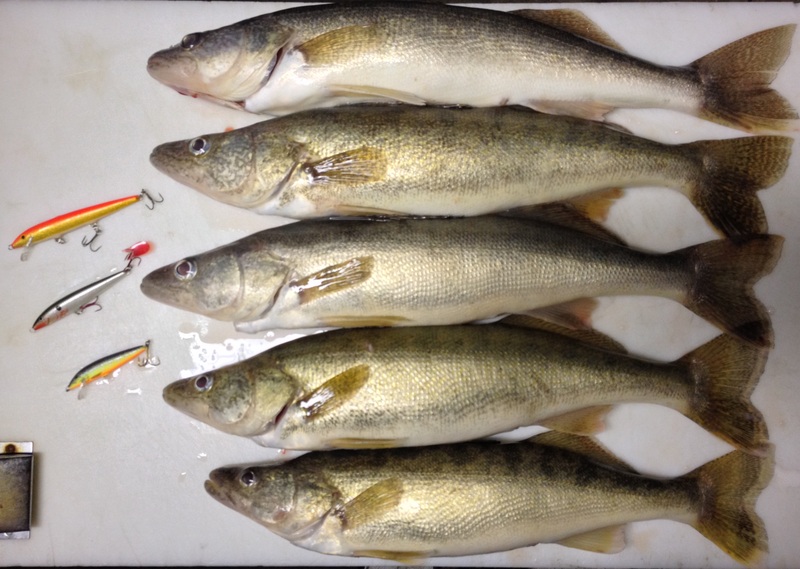 Now with some more prayers maybe my Dad and I can return to tearing up the walleye population next Spring. Since I didn’t have any family obligations for Easter I made plans to go out Sunday Evening. Most of my fish on Friday came after 8 I waited until 7:00 pm to hit the water. When I arrived at the launch there was no one take my 5 bucks (BONUS) and most of the lot was empty (Even Better). After I got my stern light post in place and checked I was on my way. 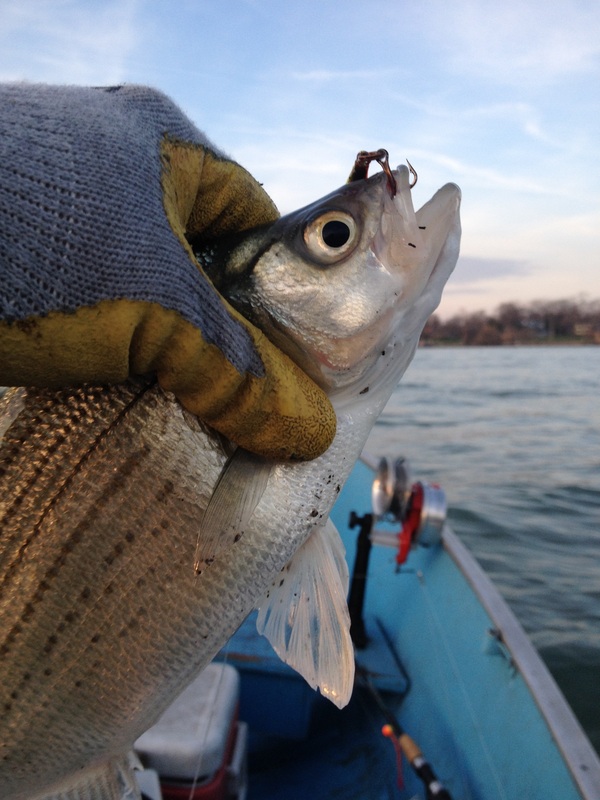 There was a south wind around 5 to 10 mph and the surface temp was right around 47 degrees. Water was a little clearer than Friday night but there was a lot of debris in the water. It looked like someone had dumped a face cord of firewood off a bridge upstream. Chances are someone’s wood pile on some beach farther up north got washed away and it had finally made its way down to my part of the world. 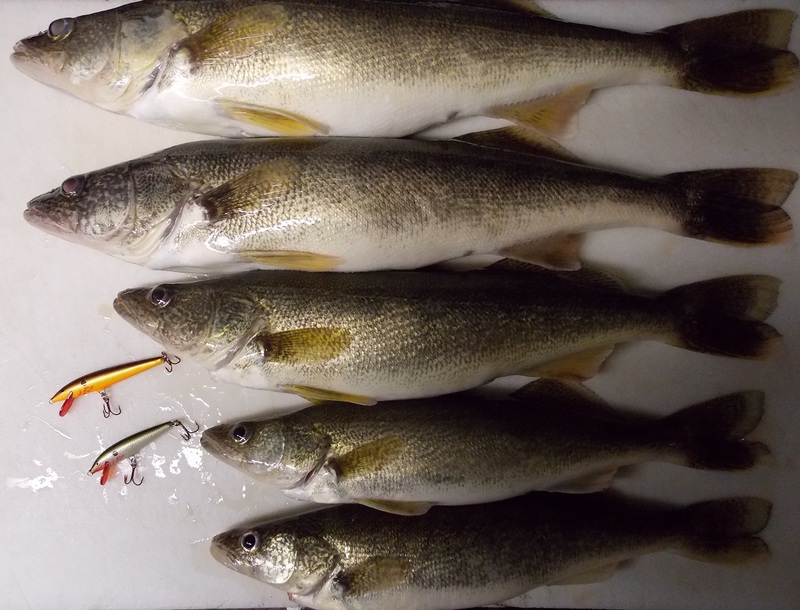 About 20 minutes in I had my first walleye of the night, another male in the 18 inch range. Not a bad start until about 10 minutes later. I had another hit but this one felt wrong. It was a light hit with a lot of quick little head shakes. My heart sank, it couldn’t be possible, and not this early, sure enough….I caught my first fish that shall not be named for the season. To make matters worse I caught another one shortly afterwards. I was dumbfounded. 10 days ago we still had ice coming down the river and here I am catching these things. I guess God decided to punish me for not going to church Sunday morning. Fortunately it was only two but where there is one or two, tens of millions will soon follow. Not much more happened until after dark. I wasn’t catching anything where I caught fish Friday so I pulled lines and headed farther downstream. My Friend Dave told me last Friday that he was marking a lot of fish in 15 feet of water down by the blue boat house so I started there. I stayed in that area for the remainder of the evening and managed to fill my 5 fish limit and lose another small one as well. I had caught 3 and lost one between 8:30 pm and 9:30 pm. My plan was to quit at 10:00 pm no matter what. The pressure was on but at exactly 9:59 pm I had number 5 in the box and by 10:01 pm and I was headed home. #11 GFR, #9 Bleeding Olive and a #7 Hot Steel Rapala took all the fish. At one point I got hung up and I busted the lip on the Bleeding Olive Rapala. Somehow I managed to impale the lip on the back hook. How I managed to do that still has me puzzled. There were about a dozen handliners out last night and from what I could see (at least the ones who had lights) everyone was catching fish. Going to try and make a few more trips this week before I head out of town for the week. Need to fill my freezer before the you know what’s show up. Still trying to figure out how I managed to do this. Again, All Males 18 to 22 inches long. My apologies to Winnie the Pooh and all the other inhabitants of the 100 acre wood but it seemed appropriate. I was able to get out of work Wednesday (10/24/12) at a decent time so I took advantage of the wonderful weather and headed to the river. By 6:45 pm I was on the river with lines in the water. The water was clear with a surface temp of 56 degrees. The winds were out of the south and very light with a clear sky above me. Word must be getting out about the fishing because there were a few new boats on the water tonight. Not much happened at first but once I got near the “Cat” I had my first fish on for the night. After I got him in the cooler I spun back around and went through the same spot. I quickly hooked into another fish but he was barely hooked and I lost him right at the stern of the boat. I made a few more passes through the area but no takers so I kept on moving north. By now the sun had set and evening was slowly taking over. I hooked into another fish but I also lost this one at the boat. This was starting to get frustrating but it happens. I can deal with a lost fish here and there but the onslaught of the weeds was more than I cared to deal with. For the rest of the night I was constantly clearing weeds off my lines. My lures spent more time out of the water than in it. At one point I became so frustrated I let out a scream of obscenities that I’m sure was heard all the way down to Gibraltar. I was still able to pick up a few fish here and there but after an hour of this I seriously debating heading in. As I was mulling over what to do next I hooked and landed my biggest fish of the night, a 24 inch 4 pounder. That made up my mind for me and I decided to stick it out a little while longer. As I was dropping my lines down I got a hit and reversed gears and brought them up with the fish. Number 4 was in the box and I was on my way to filling my limit. About 10 minutes later I was clearing lines once again when I had another hit on my kicker while the lure from my 20 foot lead was in my hand. I quickly released it and brought in my 5th for the night. I had been thinking that some of the fish might be suspended and it looks like I was right. Three of the fish I caught tonight were while I was setting lines down or checking them for weeds. Also, I shortened my kicker to less than 5 feet and I trimmed about 3 feet off of my middle lead which was now only 17 feet long. The only lead I didn’t change was my 40 footer and I didn’t catch anything on that one. Next time out I may have to try a shorter leader on my 40 inch clevice or maybe hook it up near the wire snap swivel. Final tally for the night was 5 in the box, 3 lost, 1 throwback and everything came on my short leaders. 7 fish came on the kicker and the #7 Bleeding Olive and the other 2 on the 17 foot lead (20 inch clevice) and a #9 Bleeding Copper Flash Rapala. Looks like I will be stocking up on these 2 lures over the winter. Once I pulled lines a little after 9 I ran up alongside of my friends Richard and Mark to see how they were doing. They had 3 and were just about as fed up with the weeds as I was. The 3 fish they had all came on their kicker leaders as well. Found out later that 3 other people I know took home some fish as well. Leo and Tom caught 10 and Larry ended up with 3. There are a lot of nice fish in the river right now.